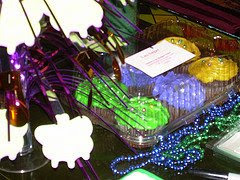 Here are some of the pics from the Mardi Gras themed cupcake party that LuxSugar made for CTTC Cupcake Meetup at Jimmy's No43 last week. We are thinking of some new spring flavors, so be on the lookout via twitter to see what we've come up with. 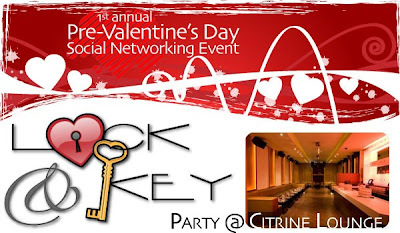 We had such a great time at the event and we can't wait for the next one! Finally, we are posting some of the pics from Lipservice with Angela and Leah. We had sooo much fun that night & we'll be going back again soon; We're also currently working on a Lipservice cupcake, so stay tuned!! 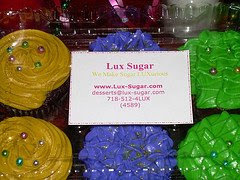 Also, we will be posting the pics from the Mardi Gras Cupcake Meetup that took place last Thursday. 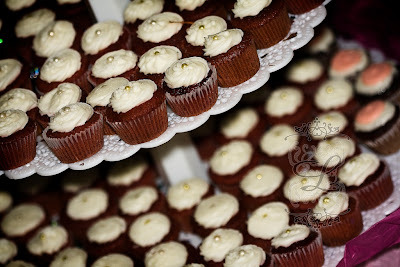 In the meantime, you can go to Cupcakes take the Cake Site to check out some of the pix! 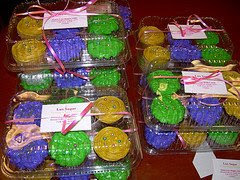 Tomorrow, Lux is dropping off the Mardi Gras Theme Cupcakes for Nichelle from CTTC for the NYC Cupcake Meetup at Jimmys No 43. See the info below! 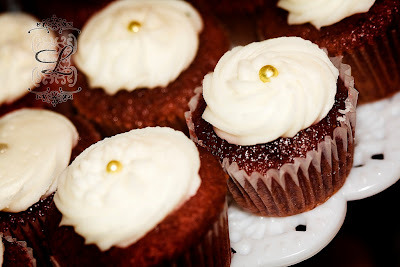 If you've never been to a cupcake meetup, you don't know what you're missing!! 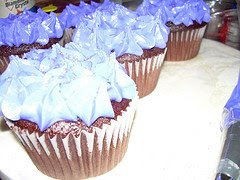 Imagine a party where the focus is CUPCAKES!! Add to it Mardi Gras Beads and Beer and you'll be in for a night of fun! To find out when the Meetups are scheduled, check the CTTC blog and Cupcake Meetup Group page often for the upcoming dates. We'll have the Mardi Gras pics up soon, along with the pics from last weeks Shade 45 Lipservice and Lonoli events. 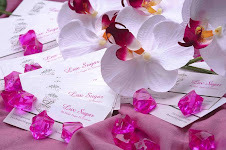 We are having a very busy valentine's week! 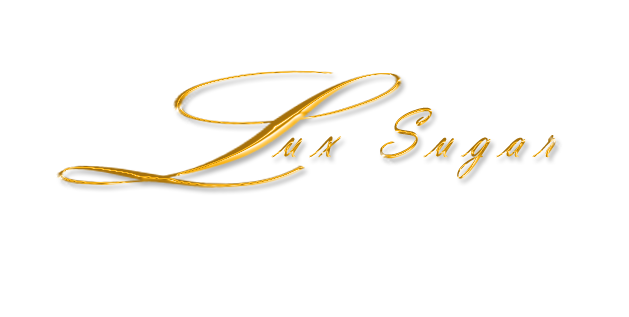 Not only is it Lux Member Heidi's Birthday on Thursday, but we've had a slew of orders for the lovely Valentine's day approaching on Saturday! Make sure you call us asap if you need some yummy desserts sent to your boyfriend/girlfriend/friend/family member/or even your pooch! We had a delivery to Conde Nast today and will post the pictures up momentarily as the mini's came out sooo cute. 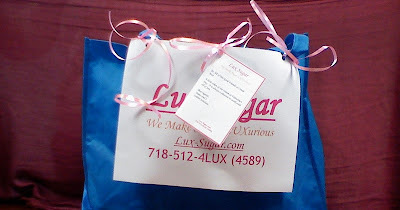 Also look out for the pics: Lux at LipService from our Monday night Pre_valentine Party at Sirius Radio w/ Angela and Leah. There will be a $1.75 for online transactions. Proceeds from this event will benefit the summer and after-school youth programs of The George Walker Jr. Community Coalition, Inc. ("GWJrCC"). GWJrCC is a 501(c)(3) community organization dedicated to community rehabilitation and neighborhood renewal by providing educational, recreational, and professional services to the East New York and Cypress Hills communities. ...& we're back to baking. Tonight we along with many other fab people will be the guests of Angela and Leah of LipService on Shade 45 --Sirius Satellite Radio for a Pre-Valentines Day Party. We're so excited as Angela and Leah are our fave talk show hosts! We'll be bringing mini Marilyn's and Audrey's to add to the festivities. It should be a wild and fun night so make sure you tune in tonight to and every other Monday night from 8p-10p. Don't forget to call in to say hi to us! Introducing - The Rick James. It's a chocolate cupcake w/ chocolate and mint icing. See the pics below. And yes, they do taste as good as they look!! !